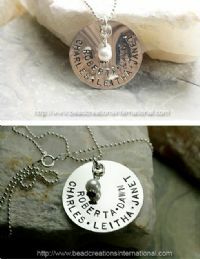 The 1 1/4" hand stamped necklace comes with 5 names on this discs. Sterling silver necklace and chain with your children’s/grandchild's names on them. If you want more than 5 names with the block font please contact us for options. Large Swarovski pearl is not included in price but can be added below.